"Family favorite in the summer, but can be cooked year-round with the broiler on cold days when you're pining for warm weather. Easy, tasty, and filling." Place chicken in a large glass or ceramic bowl. Whisk soy sauce, 1 tablespoon lime juice, honey, jalapeno pepper, and garlic together in another bowl until marinade is smooth. Pour marinade over chicken and turn to coat completely. Cover the bowl with plastic wrap and refrigerate 12 hours to overnight, turning occasionally. Remove chicken from marinade and shake off excess. Pour marinade into a small saucepan; bring to a boil, reduce heat to medium-low, and simmer for 5 minutes. Mash avocado in a bowl. Stir in tomato, minced onion, 1 tablespoon lime juice, cilantro, and hot pepper sauce until guacamole is well-combined. Cook chicken on preheated grill, basting with marinade and turning often, until no longer pink in the center and the juices run clear, 7 to 15 minutes. An instant-read thermometer inserted into the center should read at least 165 degrees F (74 degrees C). Transfer chicken to a plate and cover with aluminum foil to rest, about 5 minutes. Slice chicken across the grain into thin strips. Heat oil in a large nonstick skillet over medium-high heat. Saute sliced onion and red bell pepper in hot oil until tender, about 10 minutes. Wrap tortillas in a damp paper towel and microwave on high until softened 1 to 3 minutes. 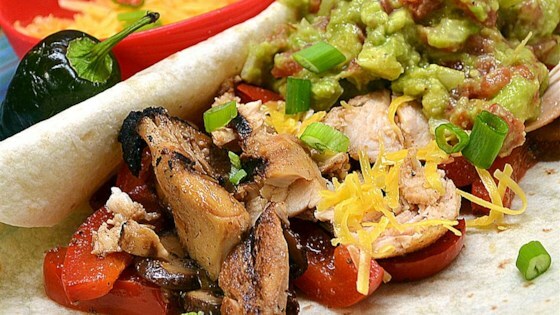 Place strips of chicken down the center of each tortilla and top with shredded lettuce, sauteed onion and red bell peppers, and guacamole. Wrap each tortilla tightly around filling. See how to put the thrill back into summer grilling. Lord have mercy this was delish!!! Good but not great. Probably use another recipe next time. Very Good!. I didn't have any jalapeno peppers on hand, so I added Picante salsa to the marinade. I also used smaller tortillas (fajita size). This will become one of our regular dishes. I used all fresh ingredients and was so delicious ! !